Moving by yourself is a daunting task, especially if you’ve amassed quite a bit of stuff. When the time comes to move, you’re not just moving—you’re purging and reorganizing your entire life. If hiring professional movers isn’t in your budget, the stress of it all can become overwhelming. Here’s how to break each task down and make moving manageable. Being prepared with the right equipment will make all the difference when it comes time to pack and move. Stocking up on boxes, packing tape, and bubble wrap will ensure you have everything you need to pack your belongings securely. You’ll also want to invest in padded moving blankets to protect your valuables from breaking while in transit. Two- and four-wheel moving dollies will make it easier to move furniture, boxes, and large appliances. It’s also a smart idea to have a tool kit handy during the move in order to take furniture apart on the go. While you might not be ready to go the extreme route of selling everything and starting over, now is the time to purge as much as possible so you don’t have to take it all with you. As you sort through your items to pack, set up “keep,” “sell,” and “donate” piles. Immediately pack up the items you definitely want to keep, and organize the “sell” items so you can throw a moving sale or quickly put them up on Craigslist. Donate anything you don’t sell to a local charity. When you have to move yourself, it’s necessary to reach out to anyone in your life who you think might be willing to help. Consider throwing a moving party, which will make the task of packing up your life not only easier, but maybe even fun. You can even go all out with cute invitations, mailing them as soon as you know you’re moving. Invitations check another task off of your moving list by updating your friends with your new address. Ask as soon as you know your moving date. The longer you wait, the less likely it is that they will be available. Have food and drinks ready—while these people might love you, they’re not going to risk throwing their backs out without at least a little incentive. Give your friends a tour of the new place upon arrival and label every box clearly so they know where it goes right away. The more organized you are before the move, the easier everything will be once you arrive at your new home. Creating a color-coded system will make your move more efficient than if you just throw items into a box marked with the room name. Set up a spreadsheet and assign a color to each room and a number to each box, marking down which items correspond to each number. This will allow you to know exactly what is in each box so you can access what you need on that first evening in the new space. There is a best practice for packing and moving every item in your home. Large furniture should be taken apart as much as possible and covered in plastic or padded moving blankets to protect from damage. Refrigerators need to be emptied and defrosted at least 8 hours before the move. Items with dangerous liquids such as lawnmowers and barbeques should be drained and stored safely. Gym equipment should be folded up or disassembled. Liquid items such as shampoo and household cleaners should be covered in plastic wrap and taped to ensure they do not leak. Don’t forget to pack an overnight bag with any toiletries and items you’ll need for the first couple of days. You’ll be thankful for it after a long day of moving leaves you wanting to do nothing but go to sleep and leave unpacking for the following day. 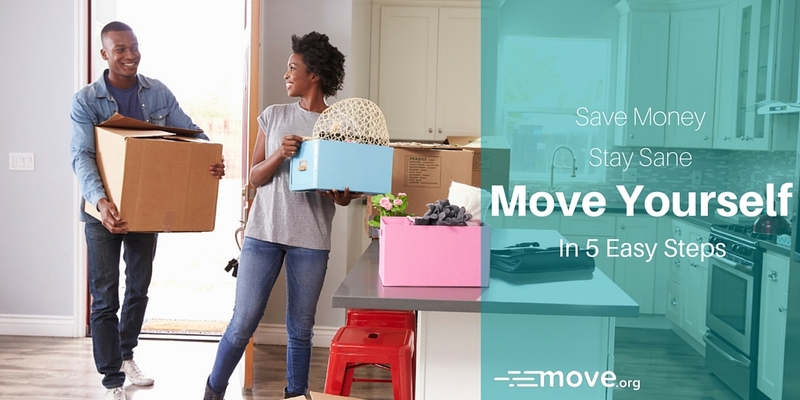 With these five steps, you will be able to move yourself without ending up in a crying fit halfway through moving day. Following this process will make the move much more manageable, and in the end you will have a beautiful new place and a fresh start—with much less stuff cluttering your space. Just remember, the earlier you start planning for it, the easier it will be. Lisa Lagace is a freelance writer, speaker, and the creator of Turn The Record Over, a lifestyle and culture blog for creative professionals.